A memoir-meets-exposé that examines our fraught relationship with the West and our attempts to clean up a toxic environmental legacy. In 2002, Texas journalist Brad Tyer strapped a canoe on his truck and moved to Montana, a state that has long exerted a mythic pull on America’s imagination as an unspoiled landscape. The son of an engineer who reclaimed wastewater, Tyer was looking for a pristine river to call his own. What he found instead was a century’s worth of industrial poison clotting the Clark Fork River, a decades-long engineering project to clean it up, and a forgotten town named Opportunity. At the turn of the nineteenth century, Montana exploited the richest copper deposits in the world, fueling the electric growth of twentieth-century America and building some of the nation’s most outlandish fortunes. The toxic by-product of those fortunes—what didn’t spill into the river—was dumped in Opportunity. In the twenty-first century, Montana’s draw is no longer metal but landscape: the blue-ribbon trout streams and unspoiled wilderness of the nation’s “last best place.” To match reality to the myth, affluent exurbanites and well-meaning environmentalists are trying to restore the Clark Fork River to its “natural state.” In the process, millions of tons of toxic soils are being removed and dumped—once again—in Opportunity. As Tyer investigates Opportunity’s history, he wrestles with questions of environmental justice and the ethics of burdening one community with an entire region’s waste. Stalled at the intersection of a fading extractive economy and a fledgling restoration boom, Opportunity’s story is a secret history of the American Dream and a key to understanding the country’s—and increasingly the globe’s—demand for modern convenience. As Tyer explores the degradations of the landscape, he also probes the parallel emotional geography of familial estrangement. 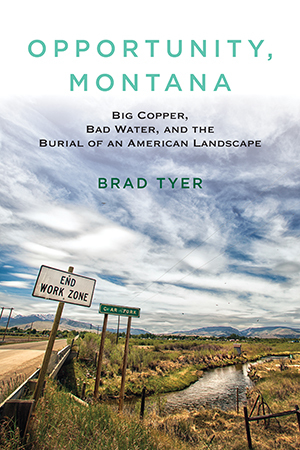 Part personal history and part reportorial narrative, Opportunity, Montana is a story of progress and its price: of copper and water, of father and son, and of our attempts to redeem the mistakes of the past.